King Solomon had it all. Wealth. Power. Prestige. Yet despite having everything he could ever want, Solomon was still unsatisfied. He soon came to a startling conclusion: Even if we have it all, it is never enough. This revelation inspired the book of Ecclesiastes, Solomon’s profound thoughts on the meaning of life. 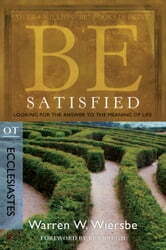 BE Satisfied examines Solomon’s remarkable insights on what holds real value in this world. 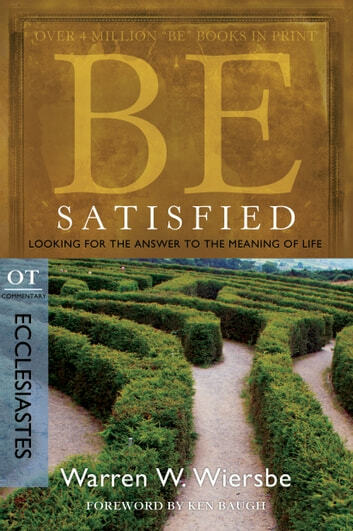 Part of Dr. Warren W. Wiersbe’s best-selling “BE” commentary series, BE Satisfied has now been updated with study questions and a new introduction by Ken Baugh. A respected pastor and Bible teacher, Dr. Wiersbe explores Ecclesiastes to find what matters most in life. You will be encouraged to live in the light of eternity, and discover the keys to having a satisfied life, no matter what life brings. Maybe a little more depth about the overall story. It was an alright book maybe a little bit more depth would have made it a tad bit more interesting . More moral value should be added for better extend the storyline and value of it . The clarity was well scripted . The chapters were a bit too short for my taste but in overall I would say that it was a good book.